The LG Spectrum promises to be a great phone, with a beautiful 4.5-inch display and boasting the fastest download speeds we've measured on any phone. But ultimately, it suffers from too many flaws — from anemic battery life to poor video quality — to compete with the Galaxy Nexus or Motorola Droid Razr Maxx. For such a large phone (5.33" x 2.71" x 0.41"), the LG Spectrum is actually quite light, at only 4.99 ounces. And its thinness and nicely rounded corners contribute to its comfort, but It's still not for the small-of-hand. Unfortunately, LG opted for a smooth, shiny back cover — large, expensive phone plus slippery case are not a good combo, and I dropped the phone (a short distance, thankfully) more than once while using it. The buttons on the Spectrum are flush with the case, making them darn near impossible to manipulate by feel. Note to cell phone manufacturers: don't sacrifice function for sleekness. The iPhone 4's buttons are beautiful AND easy to operate. The Spectrum can get quite hot while playing games and other processor heavy activities. And anytime you're generating heat, you're using up power, which showed in our experiences with battery life. The LG Spectrum has a beautiful, 4.5-inch display with bright, vibrant colors, deep blacks and excellent resolution (1280 x 720). In fact, at 329ppi, the LG Spectrum has a higher pixel density that the famed iPhone 4 "Retina Display" (326ppi). The screen is also covered with Gorilla Glass for extra protection. The LG Spectrum uses Verizon's 4G LTE network and gave me the fastest download speeds of any phone I've tested, with a peak of an incredible 47 Mbps - that's double other 4G LTE phones, including the Motorola Droid X 4 used for a side-by-side comparison. Typical speeds were in the upper teens to low 20's, which is still awesome. The speed of the LG Spectrum combined with the super-high resolution display, made for a terrific browsing experience. My one complaint, and it's not an insignificant one, is that browser comes preconfigured for Bing search rather than Google. And there's no easy way to switch. The Spectrum can act as a mobile hotspot for up to 10 devices. The LG Spectrum continues the long tradition of Android phones with under-performing cameras. Though the Spectrum sports an 8MP sensor, photos were often washed out, under-saturated and lacking in detail. The lower the light, the more noticeable the problem. Video fared even worse. While it was able to handle 1080p recording without stuttering, there were artifacts galore, from moire effects to jagged lines to false contouring (splotchy tones) and washing out in bright areas. The camera also struggled mightily to focus on the correct subject, often failing in the effort. The Spectrum runs Android 2.3 Gingerbread. The 1.5 GHz dual core processor had no trouble keeping up with normal navigation. Swype comes pre-installed. Apps can be displayed either as an alphabetized scrolling list, which is more efficient than a successive series of icon screens if you know exactly which app you're looking for, or by category. The LG Spectrum has 4GB of onboard memory and includes a 16GB microSD card (expandable to 32GB). Battery life on the LG Spectrum was quite poor. It would make it through the day under normal use, but die by evening when used more actively. And recharging times were slow. This type of performance really just isn't acceptable. Motorola realized this when they launched the Droid Razr Maxx as an alternative with 80% more battery capacity than the poorly performing Droid Razr. Given the Spectrum is nearly identical in size to the Droid Razr Maxx, a larger battery would have been welcome here, too.. 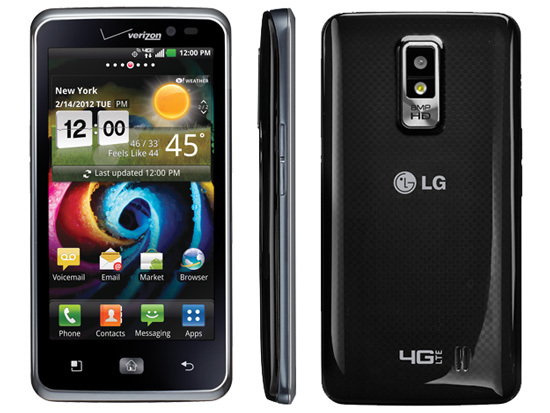 The LG Spectrum is available from Verizon for $199.99 with a new, two-year customer agreement. Or, you can purchase it from AmazonWireless for $79.99. The LG Spectrum has a beautiful display and download speeds beyond anything I've seen outside of my home FiOS line. Actually, it's occasionally even FASTER than my FiOS connection. But all of that comes at a big sacrifice to battery life. If you're going to plan for a 4.5-inch display and 1.5 GHz dual core processor, you need to plan for a big battery, as well. LG didn't, and the results were all too obvious. I was also thoroughly disappointed with the camera and video quality. Companies should steer clear of the game of promoting 8MP sensors and 1080p video, while ignoring the lenses and software to process those images. I would take a high-quality 5 MP picture over a poor quality 8 MP any day. Given its limitations, it's hard to recommend the Spectrum over the Droid Razr Maxx, though the Razr Maxx is $100 more. For those looking to keep costs down, check out the HTC Rezound, also $79.99 through AmazonWIreless.